The differences between red and black licorice involve more than just color and flavor. The root of the licorice plant is used in herbal medicine as well as for flavoring foods, including some types of licorice candy. This means that some types of licorice are not safe to consume in large amounts due to the possible side effects of consuming licorice root. Black licorice may be flavored with licorice extract, anise or a combination of the two. It also sometimes contains molasses to enhance the licorice flavor. Red licorice, on the other hand, rarely contains licorice extract and instead usually relies on natural or artificial flavors to give it a cherry or strawberry flavor. 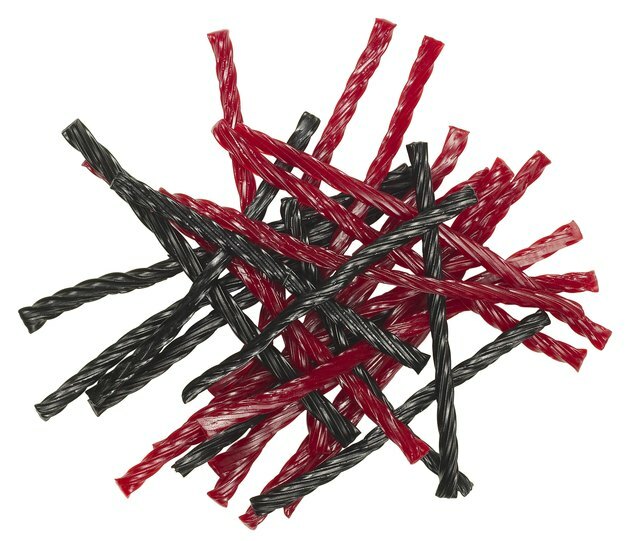 Black and red licorice have similar nutritional values, even though the ingredients are slightly different. For example, both red and black versions of Red Vines licorice contain 140 calories, 16 grams of sugar and 1 gram of protein in a five-piece serving. However, black Red Vines contain 60 milligrams of sodium and red Red Vines contain only 20 milligrams of sodium. Neither type of licorice provides any vitamins or minerals. Both types of licorice are a source of empty calories and should be consumed only as an occasional treat. If the licorice candy you choose contains licorice extract, it also contains a compound called glycyrrhizic acid or glycyrrhizin. When consumed in large amounts, glycyrrhizin can cause muscle pain, numbness in your limbs, high blood pressure, swelling, headache or fatigue. People with heart, kidney or liver disease, diabetes or high blood pressure should not consume licorice that contains glycyrrhizin. Many types of licorice made in the United States contain little or no licorice extract. Check the labels before you purchase licorice if you are worried about glycyrrhizin. Black licorice is the type most likely to contain licorice extract, although red licorice or other types of licorice may also contain this flavoring. Is Red Licorice Bad for You? What Are the Dangers of DGL Licorice?